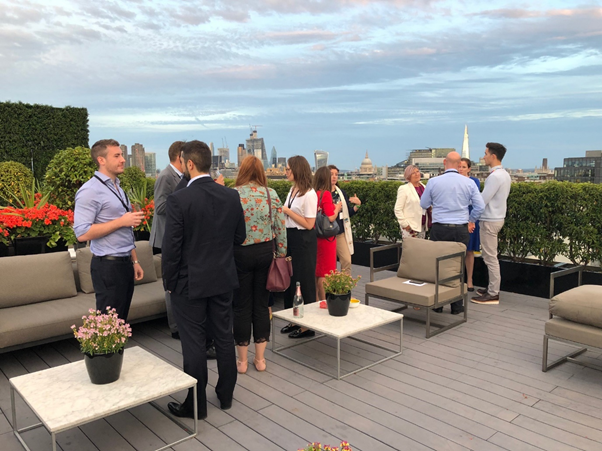 Today’s blog article has kindly been provided by Isobel Barry, Senior Associate at Carpmaels & Ransford, and is a report on the recent IP Out event. Carpmaels & Ransford is one of our Charter signatories. 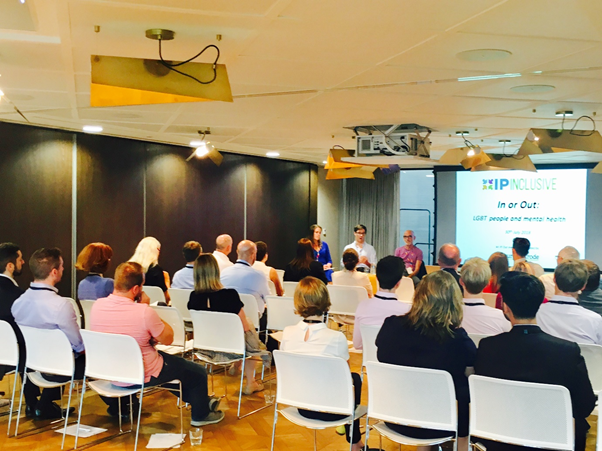 Isobel writes: “In keeping with the spirit of Mental Health Awareness Week by not putting interested parties under pressure to attend multiple events in the same week, IP Out held its event about mental health about two months later at the end of July. It was titled In or Out: LGBT+ people and mental health. Why hold a separate event addressing mental health issues for LGBT+ people? If you are thinking this, you are in company with about half of mental health workers, counsellors, psychologists and psychotherapists, who say they do not consider sexual orientation to be relevant to one’s health needs [Unhealthy Attitudes, Stonewall (2015)]. However, LGB people are more likely to experience poor mental health than the population in general, leading to problems such as attempted suicide, self-harm, anxiety, depression and obsessive compulsive disorders [Inequality among lesbian, gay, bisexual and transgender groups in the UK: a review of evidence, National Institute of Economic and Social Research, July 2016]. One study found gay men to be three times more likely to suffer from a limiting mental health condition than heterosexual men, rising to nearly five times more likely for bisexual men2. Statistics for trans* people make grim reading: nearly half (48 per cent) of trans people under 26 said they had attempted suicide [The RaRE Research Report (2015)]. Less surprising is the evidence that discrimination in society is a major contributor to the higher incidence of mental health problems among LGB people. Even in the absence of any overt homophobia, not being open in the workplace about one’s life can have a detrimental effect on a wide range of factors including satisfaction in one’s achievements and feelings of job security. Thanks to Isobel for providing the report, and to Kilburn & Strode for hosting the event.